Just a touch of modernization these gator cubes will bring. In three steps you can have a collection. It can be used for your office or home. 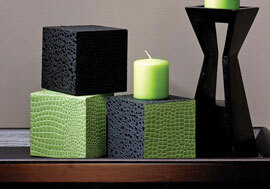 For each foam cube, use trimmer to cut six 5-1/8" squares from papers. Cubes shown are one solid black, one solid green cube, and one mix-and-match. Apply thin, even coat of craft glue onto one side of first foam cube. Position paper square over foam, flush with one side and top edge; smooth paper with fingers. Use craft knife to trim excess paper at side and bottom edges. Repeat to cover all sides of each foam cube. Let dry completely.